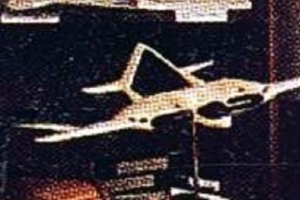 The only known picture of the so-called "Manta" project is this blurry photo of a desktop model. 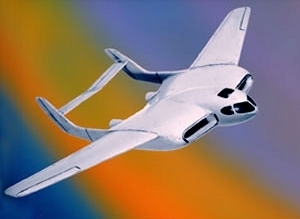 Another obscure Rutan design is this very odd-looking project supposedly conceived as a jet fighter and called the Manta. Its only appearance was as a desktop model at the back of a photo in a magazine. Equally odd is the similarity in general layout and shape between the so-called Manta and an old 1947 jet fighter project by Vincent Burnelli, the famous designer of lifting body all-wing designs — the differences being in the wing being moved to mid position, the boom brought closer together and the tail being changed to an inverted V-position with horizontal stabilizers on either side. The similarities between the "Manta" and Burnelli's 1947 jet fighter project are quite remarkable.